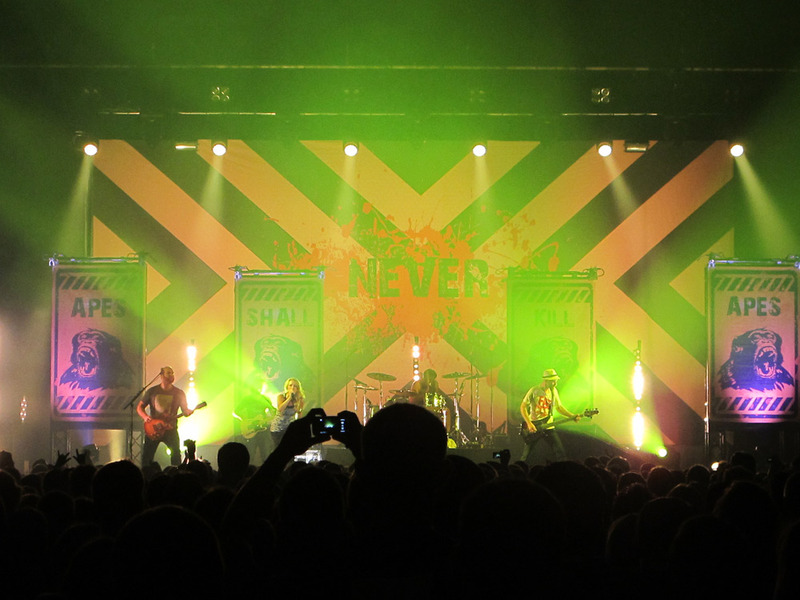 Lighting designer Stephan Aue of Ambion GmbH is one of the first LDs worldwide to use Martin Professional’s new MAC Aura wash light and placed 42 of the award-winning fixtures on the German rock band Guano Apes’ current European tour. The MAC Aura is the first compact LED moving head wash light with zoom that uses two independent color systems to produce new ‘eye-candy’ effects plus functions as a highly capable single-lens wash with fully pre-mixed color. It was launched at the PLASA trade show in London in September, winning a PLASA Award for Innovation. 1.5 x 4 meter set piece truss on wheels for easy moving on and off stage. The set piece holds huge letters in the style of the "Hollywood” sign and was equipped with an Atomic 3000™strobe and LED PAR lights. With four of the set pieces – the letters A, P, E, and S - Aue decided, due to budget and space (trailer) constraints, to switch from twelve LED PARS and four Atomics to four Auras. “I ended up with a more versatile and easier to build setup,” he says. Aue also serves as lighting operator on half of the tour’s shows with the other half operated by Christian "Maxi" Maxwitat. The Guano Apes tour is the first time Aue has programmed a tour on a Martin M1 console. "Coming from a Hog, this desk is by far the only alternative. I´ve never learned a desk this quickly and easily!" Aue says of Martin’s easy-to-use console. “The whole desk felt familiar right from scratch. It´s just a pure logical interface and with a few small exceptions, I felt home right away. Aue concludes, “I cannot thank Markus enough because his support is really awesome. I have a second M1 console as well and it gives me the opportunity to get to know it even better.” All lighting gear for the Guano Apes “Bel Air” tour is supplied by rental company Ambion GmbH (www.ambion.de).